NewPath Learning standards-based science curriculum mastery flip chart set. Each curriculum mastery flip chart is mounted on a sturdy easel. 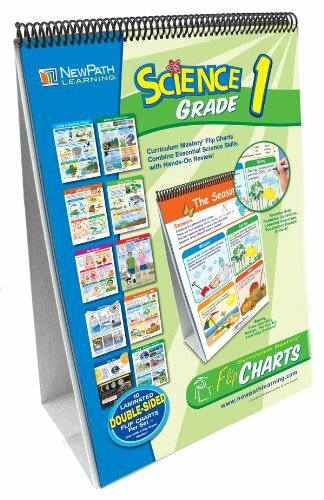 10 double-sided, laminated 18-inches length by 12-inches width charts. Side 1 features a colorful, graphic overview of the topic. Side 2 serves as a "write-on/wipe-off" activity chart featuring questions, labeling exercises, vocabulary review and more. Activity guide featuring blackline copymasters and exercises. Set Includes the following 10 charts: living and nonliving things; where animals live; life cycles; food chains; my senses; human body; weather; the seasons; the sky; land, water and air. Grade 1. Academic standard: California, Florida, National, New York, Texas.